Determined to get through the weekend with her professional reputation intact, Marley grits her teeth and sends out her best “unavailable” vibes, but Luke Jessup doesn’t give up that easy. A former Marine and a current SWAT team officer, his focus is legendary—and it’s on Marley. Jeopardizing her job is bad enough, and starting a relationship based on half-truths is worse—yet Marley is beginning to wonder if certain risks are worth taking, especially in the name of true love . .
"What took you so long, woman?" 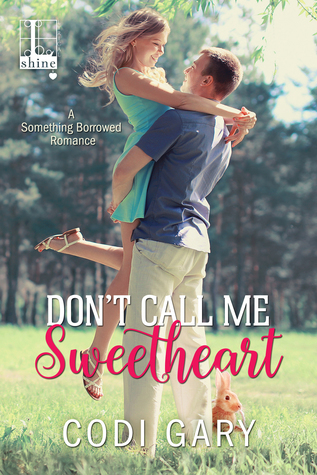 Don't Call Me Sweetheart is the first book in the Something Borrowed series. Marley Stevenson dreams of becoming a book editor and relocating to NYC. In the meantime, she lives in Sweetheart, California, a small town where her mother has a cafe and she works as a wedding planner and sometimes fills in as the maid of honor or a member of the bridal shower. Her next big client is the famous Sonora Star. Sonora has had some bad press and a recent stint in rehab but her wedding is going to be phenomenal. Sonora is marrying into money. Her fiancee Brent comes from a well-known wealthy family. Marley can't wait to start planning the impending wedding and with the commission she receives, her dreams can become a reality. Luke Jessup is part of a SWAT team. He travels to Sweetheart to help his best friend Brent who's marrying Sonora. He's going to be the best man. Luke doesn't like Sonora. He believes his friend can do much better (and I agree wholeheartedly). When he stumbles into Marley, he's attracted to her. He thinks she feels the same way, but getting her alone is proving more difficult than what he was expecting it to be. Unbeknownst to him, there is a little issue of a confidentiality agreement and Marley is not able to date the best man. Meanwhile, Luke can't understand Marley's evasiveness. I love Luke. He was a good friend to Brent and he was awesome with Marley and her mother. He was sweet and romantic. He was also very patient with Marley. He kept on coming back to her despite being pushed away, repeatedly. I had a harder time liking Marley. She was too childish for my taste. Most of the time, her feelings for Luke run hot and cold. Her last excuse for pushing Luke away after they had been together was weak in my opinion. Still, I'm happy with how things worked out for this couple. As a side note, I enjoyed the secondary characters and I was happy with the way Sonora and Brent's relationship was handled. A complimentary copy was provided by Kensington Books via Netgalley in exchange for an honest review.